At anytime you can go below, and WATCH THE TUTORIAL. 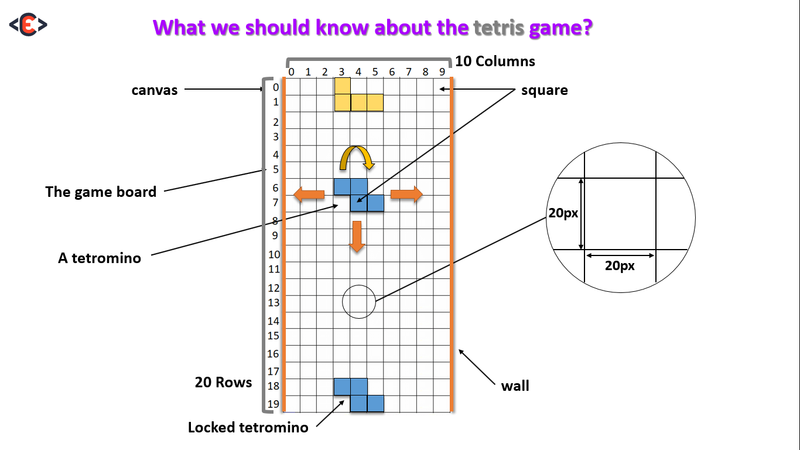 First things first, this is what you need to know about the Tetris game. The game board: the game is played on a board, that has 20 rows and 10 columns. in programming languages that's a 2D array. Tetrominoes: are the pieces we play with, there are 7 different pieces, Z, T, L, O, I, J, and S. the pieces can move to the right, to the left, to the bottom, and rotate. and when a Tetromino reaches the bottom we lock it to the board, and we ask for a new one. Walls: we have two walls, the right and the left wall. Square: the board and the Tetrominoes, are both made of squares, a square by default is 20px by 20px rectangle. Create the PIECES (or tetrominoes). let's take the Z piece as an example. this how it looks like. The idea is, for a VACANT(empty) square we give 0, and for an OCCUPIED square we give 1. Now this is just one pattern out of four, the code for this pattern is this. 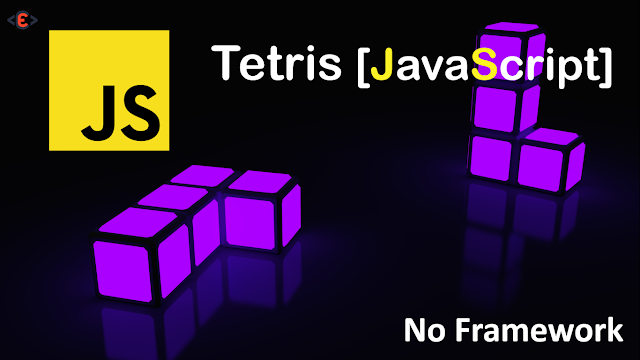 Remember the player should be able to rotate a piece, the easiest way to do that with code, is to put all the patterns of a Tetromino inside an array. 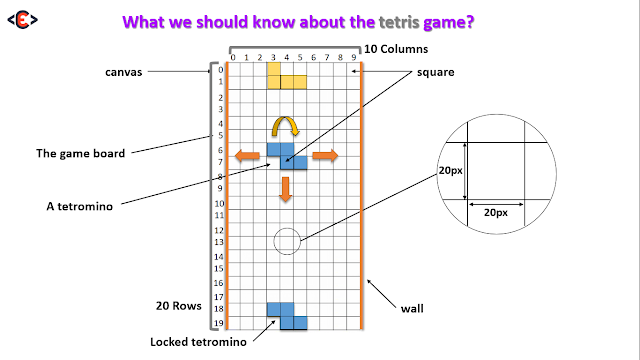 So we need to create an array for each Tetromino, and here is the example for the Z piece. Now you should be able to figure out the code for all the other pieces. but it's not really necessary to type in the code all over again, since I already did that. actually you don't have to type in any code for now, all you have to do for now is to understand the logic behind the game, now that you understand how we create the pieces using code, let's move and see how to create our board. The board is a 2D array, means an array inside another array, which means we will need two for loops, the first for loop, will create the rows, and the second will create the columns. a 20px/20px SQUARE is our UNIT. Since the board and the pieces are both made of squares, we will use a constant called SQ (for square) = 20, as a unit. Let's now talk about how to draw a square. a square is a rectangle for that,we will use a method, which is; ctx.fillRect(X,Y,W,H); X and Y, are the square position, and W is the width of the square, and H is the height of the square. Before that, we need to define the color with, we want to draw our square, so we need to say; ctx.fillStyle = "red"; the square must now has a red color. We will get a square at the top left corner, with a red color, and width and height both equal to 20 pixels. To add a stroke for that square is so simple. Now we should see our square with black stroke. To make this code reusable, we just need to put it inside a function called drawSquare, this function will get as arguments, the X and Y position, and the color. Now to draw the square above, all we need to say is, drawSquare(0, 0, "red"), and we will get the same result.